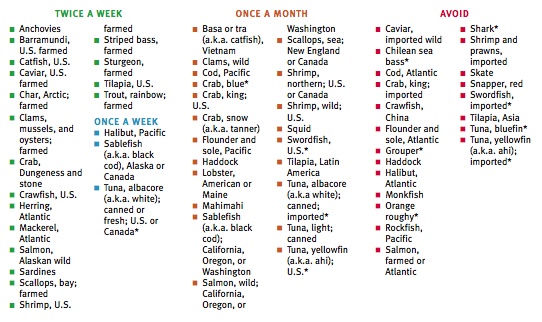 Real Simple consulted a marine scientist who works for a non-profit regarding seafood safety and I use this often when meal planning. To read more details on the matter and to print out a pocket-size guide, click here. Very enlightening! It's also good to match this list up to the sustainable seafood pocket guides Monterey Bay Aquarium puts out! So you can make sure it's good for you...and the environment, haha. My husband's family are commercial salmon fisherman in Alaska. And to that end, I am very involved in their fishing operations. It's nice to see wild Alaskan salmon listed as one of the most eco friendly options. Farmed salmon, at least the Norwegian kind, is among the most sustainable, healthy and eco-friendly farmed animals we have. Farming livestock takes 10 kgs of grain pr kg of meat you get. Farming cold-blooded salmon is almost a 1 to 1 relation, whereas lots of the ingredients in the food comes from sustainable sources, not farmland. Recent, independent, studies, show that Norwegian salmon is very healthy. A lot more healthy than the minimum requirements set by for instance the EU. While it certainly is important to eat Eco-friendly, in most cases Mercury levels in fish are not relevant as they almost always have higher Selenium levels which effectively renders the Mercury harmless. There are some exceptions, such as swordfish. Avoid imported shrimp? That's just a mistake. I live in Ecuador and we export shrimp to all parts of the world and there is nothing wrong with our shrimp. I LOOOVE Chilean Sea Bass. :( At least I can eat tons of crab and clams. @anonymous - funny. They're saying the same thing in the Gulf of Mexico right now. I wonder if they're more concerned about the food on our table... or the food on theirs. If this was a list of seafood that is good for you and environment, I can understand why imported seafood would be down on the 'avoid' list. But the title of the list says "what is safe to eat"
Avoid imported fish because they're unsafe? Chilean Bass is the best! Now you are gonna to say wines from California are better than Chilean wines too? Please, give me a break!